Jefferson students show off their Match Day letters. They vied for 32,000 spots among 4,800 residency programs. 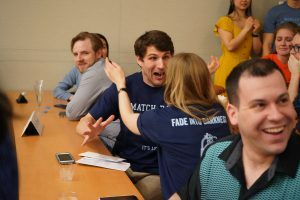 Connolly Auditorium erupted in cheers, hugs and tears of joy as Sidney Kimmel Medical College students tore open their envelopes in unison to reveal where they will complete their residencies. A mix of nerves and excitement, Sean Maloney also appreciated the gravity of Match Day. He will head to Providence Sacred Heart Medical Center in Washington and then Florida’s Jackson Memorial Hospital for diagnostic radiology. 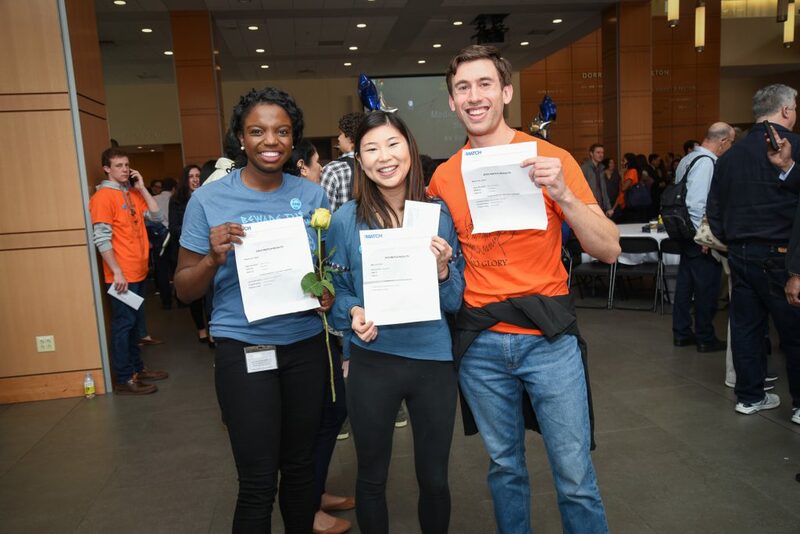 At the March 15 event held at schools across the country, Charles Pohl, MD, Jefferson’s vice provost and vice dean of student affairs, congratulated students for completing this challenging journey and wished them well in the years ahead. Joyful students opened their envelopes in unison to reveal where they will complete their residencies. “I’m proud that each of you will be a fellow alum of Sidney Kimmel Medical College in a few short weeks,” he said. Two students matched into the military, and 25 percent of students matched into a Jefferson hospital or affiliate. In toasting the class of 2019, Mark L. Tykocinski, MD, provost and executive vice president for academic affairs at Jefferson, praised the students for their hard work and persistence. “I’m confident your incredible talents will take you where you want to be,” said Dr. Tykocinski, the Anthony F. and Gertrude M. DePalma Dean of the Sidney Kimmel Medical College. After the ceremony, students—clad in “Beware of the Ides of Match” and orange Gritty-themed “No Grit/No Glory” T-shirts—streamed into the lobby and Lubert Plaza to celebrate with family, friends and significant others. Tommy Lindeman surprised his girlfriend, Jefferson student Lauren Burton, by wearing a “She’s a Match” shirt with a bitmoji illustration of her on it. A happy Burton will go to Abington Memorial Hospital for OB/GYN. “I know it’s meant to be,” she said.